The youngest person ever to achieve a Certified SOLIDWORKS Expert (CSWE) designation says a recent trip to SOLIDWORKS World has changed his life. Lucas Crupi is 15 and a member of the FIRST Robotics team at his high school in Thunder Bay, Ontario, Canada. It was through the team that Lucas was introduced to SOLIDWORKS 3D CAD software. Almost entirely self taught, Lucas used a combination of Javelin Technologies online resources and equal doses of smarts and determination to achieve the prestigious designation in a matter of months. Next up on Lucas’s wish list was to have the SOLIDWORKS World experience. He contacted Javelin’s education specialist to find out how, as a high school student, he could get there. Javelin connected Lucas to the right people at SOLIDWORKS and got him set up with a pass for Student Day, which is for students and their teachers or mentors. The pass provides free, one-day access to all open conference sessions, including the afternoon student panel discussion “Life After School” and admission to the Partner Pavilion. In the general session on the morning of Student Day, Lucas was surprised and excited to hear an announcement by Suchit Jain, VP Strategy & Business Development for Dassault Systemes SOLIDWORKS, who publicly recognized his achievements as the youngest ever CSWE. It was a memorable start to a day that included many remarkable moments for Lucas. A highlight for him was meeting Robotics Team 148, world champions and a group of students that Lucas and his robotics teammates look up to. “I posted a message in my team’s chat group and everyone was so jealous,” Lucas says. 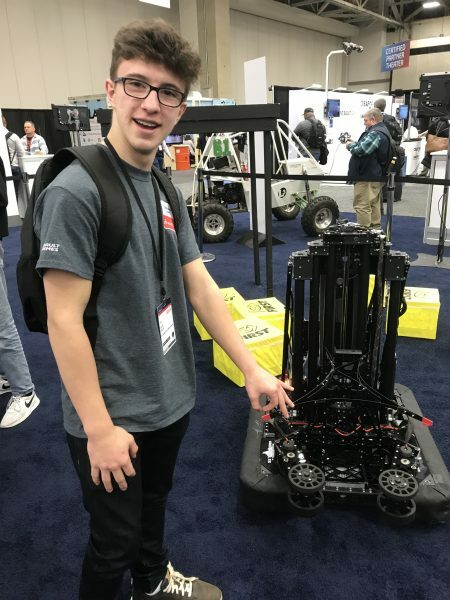 Meeting VIPs was a theme for the day, and Lucas is grateful to Javelin Technologies for connecting him and raising his profile in the SOLIDWORKS community. SWW was the first event of that scale that Lucas has ever attended. If given the chance, he says he would also love to attend 2020’s 3DEXPERIENCE World (the new name for SWW). In the panel discussion about life after school, notable SOLIDWORKS customers talked about what life could be like after graduation and the steps students should take to boost their careers. In a session about certification, Lucas discovered the other certifications he could get and how to use them in his career. What stands out when talking to Lucas is his desire to help others learn SOLIDWORKS so they too can sharpen their design skills, create better designs, and understand the power of the software. He has already helped several other students learn how to use SOLIDWORKS and has inspired a few to go for certification. He even hopes to encourage other high schools and post-secondary institutions in Thunder Bay to become better equipped. It was less than a year ago that Lucas began working with his school robotics team and using SOLIDWORKS, yet he already feels the impact on his life. Learn more about how technology available from Javelin empowers educators and students every day.